A group of small deciduous trees and shrubs with showy fruits and good autumn colour. 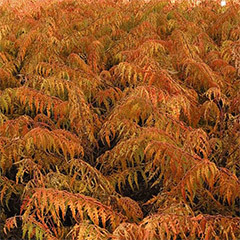 In fact, the spectacular fiery autumn show is one of the main reasons this plant is so popular in the UK. Foliage: Deciduous. Light green, fern-like or pinnate leaves. Turning yellow to orange/red in the autumn. Flowers: tiny yellow flowers, followed by dense clusters of red fruiting heads. Flowering Period: Spring and summer. Soil: Fertile moist well-drained soil (chalk, clay, sand or loam). Acid, alkaline or neutral pH. Conditions: Full sun. Grow in a south, west or east facing aspect, in either an exposed or sheltered location. Origin: North America, South Africa, eastern Asia, northeastern Australia. Toxicity: Toxic if eaten. The sap of some species is also highly irritant. Plant in an open sunny site in any well-drained ordinary garden soil. Plant between autumn and spring. 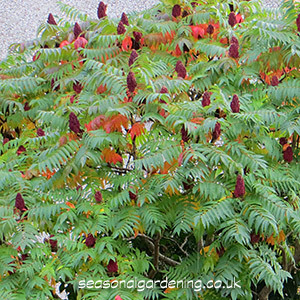 Makes a good specimen shrub/tree in a small garden. However, beware of suckers, which can be a common annoyance and allow the plant to spread beyond its allotted bounds. Due to its suckering nature it is not recommended for use as a specimen plant in a fine lawn. Requires very little care and attention once established. Not necessary. Remove root suckers in winter. R. typhina can be cut down to ground level in late winter to encourage vigorous regrowth the following spring. Can be affected by coral spot fungus. Take semi-hardwood cuttings in summer or remove and replant rooted suckers. Rhus typhina (Syn. R. hirta) is a large tree like shrub with brown down covered branches that resemble dear antlers, hence its common name the stag's horn sumach. It has upright clusters of greenish-white flowers that turn to a rich velvety textured red. The leaves turn from green to shades of yellow, orange and red in the autumn. Height to 15ft (4.6m). R. t. 'Dissecta' (cut leaf stagshorn) has finely cut leaves and striking autumn colour. R. copallina (dwarf sumach) is a small upright shrub with long pointed leaves that turn reddish-purple in the autumn. The small yellow/green summer flowers transform into bright red fruits. Height to 4ft (1.2m).